Thanks to his looks, twice entrant and one time Eurovision presenter Sakis Rouvas has often been dubbed a Greek God. Now Sakis is about to actually portray God Dionysus in an upcoming production of ancient Greek tragedy Bacchae. ‘I am so looking forward to begin (the performances). Already we work feverishly every day for the rehearsals of the play’ were the singer’s backstage comments to Greek TV. Sakis Rouvas should be in his element as theatre company ARGO intend to base the play’s staging on music. Even though this will be the artist’s theatrical debut, Sakis has previously acted on film. Bacchae is a tragedy by ancient Athenian playwright Euripides. In it, god Dionysus, son of Zeus, is trying to assert his divine status, which is being disputed by the family of his mortal mother. ‘The person cast as Dionysus should represent something new, bold, beautiful, something that will enchant modern audiences (…) That’s why we chose Sakis Rouvas for Dionysus’ commented the director of the production, which premieres in mid-July and is scheduled to tour around the country. Overcoming adversity, one of Bacchae’s themes, also ties in with Sakis’ latest TV project. Eroes Anamesa Mas (Heroes Among Us) is the Greek version of a Swedish TV format showcasing people trying to overcome obstacles and make a difference in other people’s lives. Alongside presenting, acting and his entrepreneurial activities, Sakis’ music career remains strong. The artist’s nominations in the 10th MAD Video Music Awards, a popular awards ceremony set to take place this Tuesday 25th June, include Artist as well as Video of the Year. Sakis Rouvas represented Greece at the Eurovision Song Contest first in 2006 finishing third with the song Shake It and again in 2009, where he came 7th with This Is Our Night. In the meanwhile he also hosted the contest in 2006. ERT to be replaced by NERIT? Koza Mostra & Agathon: Alcohol on an empty stomach? Below you can see Sakis performing his song Tora live at the 2012 Mad Awards. Tora has received four nominations in this year’s event. A leading role in a genre as prestigious as ancient drama is not the easiest way to debut into stage acting. Sakis’ casting in Euripides’ Bacchae, has already been met with scepticism by traditionalist critics. 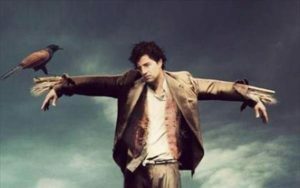 However, his film acting demonstrates competence; in the past, Rouvas has proven both his work ethic as well as the fact he does not shy away from a challenge. Even when his inexperience is evident (as was the case with his first steps into presenting), his charisma and stage presence are usually adequate to see him carry through. Sakis could therefore be a worthy choice for god Dionysus indeed.